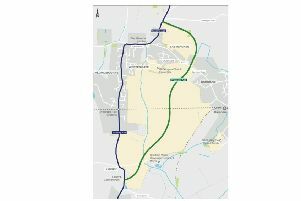 Plans to install a 9.92km underground wastewater pipe from the west of Chichester to Tangmere have been approved by the county council. Applications for the pipeline, along with three new pumping stations, were given the nod at a meeting of the planning committee on Tuesday (September 11). While such pipelines fall under permitted development rights – a national grant allowing certain building work to be carried out without the need for planning permission – its potential impact on the West Sussex environment meant it had to be considered by the committee. The pipeline will run from Clay Lane, west of Chichester, to the Tangmere wastewater treatment works, in East Hampnett Lane. It will pass under rural and built-up areas, including the Chichester & Graylingwell Conservation Areas, the A286 and A27, Graylingwell Registered Park & Garden, the River Lavant, and the Chichester Dyke Scheduled Monument. The committee received an objection from Fishbourne Parish Council which had concerns about the potential impact a pumping station and sewer West of Chichester would have on the parish. The concerns were shared by Westhampnett Parish Council, which was worried about the impact its pumping station would have on agriculture as well as the visual impact faced by residents. As a result of the Westhampnett objection, the location of that pumping house was moved to a site further from the River Lavant. In addition, there were five letters objecting to the plan. The pipeline will pass under playing fields at the University of Chichester and, while having no objection to the application, a spokesman for the university raised concerns about the safety of students during the work. She added that there had ‘not been sufficient discussion’ with the university. The applications make up the Chichester Growth Pipeline, which will serve three housing development sites allocated in the Chichester District Council Local Plan 2014-2029. Building work is expected to take two years. All four applications were approved.